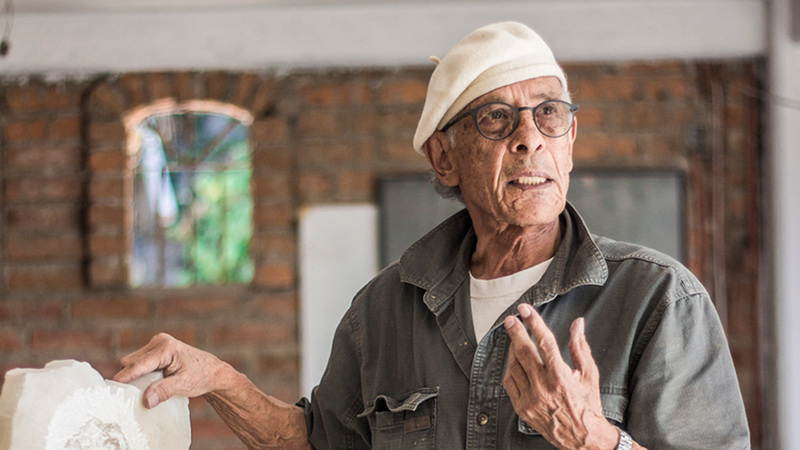 Mexican Master sculptor Manuel Palos celebrates 50 years of successful career with the launch of his new website www.manuelpalos.com. Palos is dedicated to architectural restoration, conservation and sculpture projects. He was born in the state of Zacatecas but he currently divides his time between San Francisco, California (where he has a studio) and Puerto Vallarta (where he holds stone carving and sculpture workshops). Some of his biggest achievements over his half-a-century trajectory in San Francisco are the restoration project of the Palace of Fine Arts in 1966 (where he served as a mold-maker and assistant to the sculptor), the recreation of thirteen eagles and twenty ornamental tulips for the Pacific Telephone Building and the design and carve of a fireplace in the shape of a dragon at the house of the Hollywood actor Nicolas Cage. In 2002, he contributed to restore and carve Los Arcos del Malecón in Puerto Vallarta, after the hurricane Kenna. A timeline featuring pivotal moments in the Manuel Palos vast history. Recent videos featuring the work of Manuel Palos. An interactive map that locates the landmark projects by Manuel Palos in the City and County of San Francisco. Contact page to request quotes, and information regarding sculpture retreats, and classes.